Guenter Wamser sets off from Patagonia nearly 20 years ago, bound for Alaska. German adventurer Guenter Wamser has completed his epic 20-year ride from Patagonia to central Alaska, ending one of the greatest horseback journeys in human history. “A few days ago we arrived at our final destination in Alaska,” Wamser told Horsetalk by email. “This is the end of my long horseback ride from Argentina to Alaska. His ride came to an end at a small town at the foot of Mt Healy Denali, nearly 20 years after his departure from Patagonia, near the southern tip of South America. In a brief update on his website, Wamser reported: “At the end, we found exactly what we wanted for our arrival: no great reception, no party, no band – but a large pasture with lush grass. “They know – the nomadic life is over. Now, there is only eating, sleeping and playing – a whole winter long. It was an exciting summer. “Alaska had some surprises and challenges to offer,” he said, promising an update for his supporters soon. Wamser covered more than 25,000 kilometers (15,535 miles) during his journey, which began in 1994. His journey took him from Argentina into Chile, Bolivia, Peru, and Ecuador. He reached the top of South America five years later, in 1999. Guenter Wamser arrives in Alaska. In 2001, Wamser resumed his ride, taking four years to reach Mexico after riding through Panama, Costa Rica, Nicaragua, Honduras, El Salvador, and Guatemala. He crossed Mexico, but his Criollo horses were not permitted entry into the United States because they were found to be infected with the tropical protozoan disease, equine piroplasmosis. They were rehomed and Wamser adopted four formerly wild mustangs, which had been captured by the Bureau of Land Management and retrained by prison inmates in Canon City, Colorado, as part of a rehabilitation program. In 2007, he and his traveling friend, Austrian-born Sonja Endlweber, began riding the Continental Divide Trail, heading north through New Mexico, Colorado, Wyoming, and Montana before entering Canada. They wintered over in the Yukon and have since used the northern summer to push north to complete the ride. Wamser, who was born in 1959, had worked initially as an aircraft mechanic but, at the age of 25, took a different course. He started to travel, first with a motorbike. After a few years, he discovered the joys of traveling with horses. CuChullaine O’Reilly, a founding member of the Long Riders’ Guild, the international association of equestrian explorers and long-distance riders, describes Wamser, who is also a founding member of the Long Riders’ Guild, as a talented author and a fine photographer. “He is also rightly considered Germany’s most important living equestrian explorer. “During the many years and the thousands of miles he has ridden, he has successfully survived tremendous dangers, overcome incredible challenges and always treated his horses with the utmost kindness. O’Reilly noted: “By using Criollos from the pampas, and Mustangs from the plains, both parts of Guenter’s amazing journey have been done on native horses which originated at either end of the Americas. 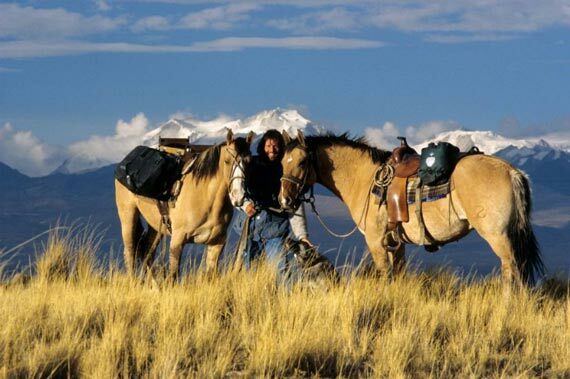 “These great horses cost very little but have turned out to be extraordinary examples of how good, strong native horses are so well suited for equestrian travel.